The Internet of Things (IoT) as a concept is fascinating and exciting, but the key to gaining real business value from it, is effective communication between all elements of the architecture so you can deploy applications faster, process and analyze data at lightning speeds, and make decisions as soon as you can. Things: These are defined as uniquely identifiable nodes, primarily sensors that communicate without human interaction using IP connectivity. Gateways: These act as intermediaries between things and the cloud to provide the needed Internet connectivity, security and manageability. Network infrastructure: This is comprised of routers, aggregators, gateways, repeaters and other devices that control data flow. Cloud infrastructure: Cloud infrastructure contains large pools of virtualized servers and storage that are networked together. Internet of Things (IoT) is one big winner in this entire ecosystem. IoT is creating new opportunities and providing a competitive advantage for businesses in current and new markets. It touches everything—not just the data, but how, when, where and why you collect it. The technologies that have created the Internet of Things aren’t changing the internet only, but rather change the things connected to the internet—the devices and gateways on the edge of the network that are now able to request a service or start an action without human intervention at many levels. Because the generation and analysis of data is so essential to the IoT, consideration must be given to protecting data throughout its lifecycle. Managing information at this level is complex because data will flow across many administrative boundaries with different policies and intents. Generally, data is processed or stored on edge devices that have highly limited capabilities and are vulnerable to sophisticated attacks. International Data Corporation (IDC) estimates that 90% of organizations that implement the IoT will suffer an IoT-based breach of backend IT systems by the year 2017. Regardless of the role your business has within the Internet of Things ecosystem— device manufacturer, solution provider, cloud provider, systems integrator, or service provider—you need to know how to get the greatest benefit from this new technology that offers such highly diverse and rapidly changing opportunities. IoT privacy concerns are complex and not always readily evident. Security standards, for platform configurations, involving virtualized IoT platforms supporting multi-tenancy is immature. New uses for devices—as well as new devices—sprout and grow at breakneck speeds. Developing the embedded software that provides Internet of Things value can be difficult and expensive. Control systems, vehicles, and even the human body can be accessed and manipulated causing injury or worse. Health care providers can improperly diagnose and treat patients. Malicious parties can steal identities and money. Unanticipated leakage of personal or sensitive information. Unauthorized tracking of people’s locations, behaviors and activities..
Vandalism, theft or destruction of IoT assets. Ability to gain unauthorized access to IoT devices. Ability to impersonate IoT devices. Gartner predicted at its security and risk management summit in Mumbai, India this year, that more than 20% of businesses will have deployed security solutions for protecting their IoT devices and services by 2017, IoT devices and services will expand the surface area for cyber-attacks on businesses, by turning physical objects that used to be offline into online assets communicating with enterprise networks. Businesses will have to respond by broadening the scope of their security strategy to include these new online devices. 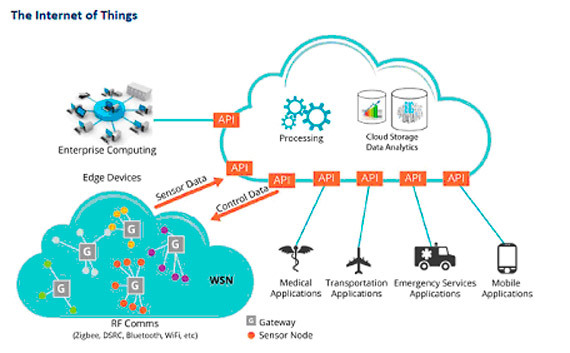 Developing solutions for the Internet of Things requires unprecedented collaboration, coordination, and connectivity for each piece in the system, and throughout the system as a whole. All devices must work together and be integrated with all other devices, and all devices must communicate and interact seamlessly with connected systems and infrastructures. It’s possible, but it can be expensive, time consuming, and difficult. Acquire and manage data to create a standards-based, scalable, and secure platform. Integrate and secure data to reduce cost and complexity while protecting your investment. Analyze data and act by extracting business value from data, and then acting on it. Security needs to be built in as the foundation of IoT systems, with rigorous validity checks, authentication, data verification, and all the data needs to be encrypted. At the application level, software development organizations need to be better at writing code that is stable, resilient and trustworthy, with better code development standards, training, threat analysis and testing. As systems interact with each other, it’s essential to have an agreed interoperability standard, which safe and valid. Without a solid bottom-top structure we will create more threats with every device added to the IoT. What we need is a secure and safe IoT with privacy protected, tough trade off but not impossible.